Smokio is the world’s first “smart” vaporizer - not only does it deliver satisfying puffs of e-liquid vapor, it tracks your consumption via a free mobile app to give you insight into your usage, encouraging a healthier, smoke-free lifestyle. Right now, Deadspin readers can pick one up for 25% off - just $59.99 + free shipping. 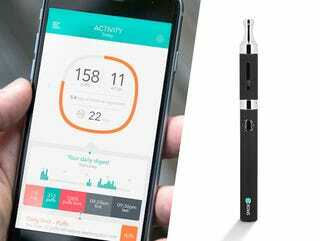 There’s plenty of other vape pens on the market, but Smokio stands out by providing you with actual data on your intake via their free mobile app (iOS & Android). You’ll be able to see everything from puff duration and nicotine intake to financial savings and life expectancy. You can even set goals and receive notifications when you hit milestones to help ease the transition from smoking to vaping. Read on for more information, and head to the link below to get yours today. Smokio can ship to the US and a number of other countries, and shipping is included in the sale price. US customers will get theirs in 1-2 weeks, international customers may take 3-4. Interested? Head to the link below and get yours today.